All measurements have two parts: a number (the measurement) and a unit. One is not exclusive from the other. You must give both! Ex. 2 inches, 0.9 lbs. The SI System is based on the metric system which uses a combination of prefixes and base units to form new units of varying size. *Volume is a bit tricky. We base the unit of volume we use on the physical state of the substance, that is, whether it is solid, liquid, or gas. Solids use cm3, liquids use mL, and gases use L.
It is important to be able to use both systems and be able to convert between one and the other. 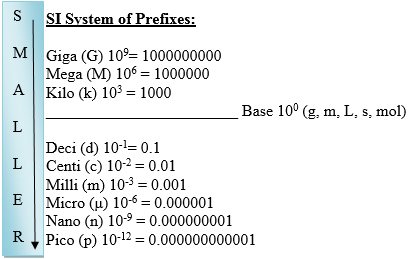 SI Prefixes: The SI system is based on the metric system which uses a base of 10 and prefixes to change units. The American/English does not follow a pattern. There are many others but we will stick with these for our purposes. Large units are generally not used in chemistry as they might be in other sciences such as computer science (mega, giga, etc. ); smaller units are more often seen in chemistry.